I am a sucker for a good diner breakfast. Who isn't from time to time?! The eggs, buttered toast, sticky booth seats, never-ending coffee, and the people watching -Oooohhh the people watching- it's always a fun experience. "R" and I are very lucky to have a great little hole-in-the-wall diner close by. We can often be found there on Saturday morning before our refrigerator has been filled for the upcoming week. While the owner is grouchy (I think it's part of the restaurant's charm), the place is nothing to look at twice from the outside, and the crowd eclectic- I've decided that I love this diner. 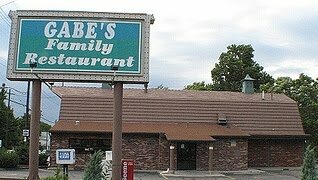 So I decided to share it with you...Gabe's Family Restaurant. By no means is it worth any sort of drive. We all (should) have a version of a diner in our own neighborhood, and I am sure that there are much better out there. However, I am pretty over-the-moon that we ended up with a good one that is so conveniently located close to home. I just love the Saturday or Sunday morning experience of a diner. And, the greasy food and hearty helpings are always welcomed after a night out or before a long day of weekend activities. While your diner might be better, I am here to tell you about the $2.99 special- my dish of choice absolutely every single time that I am there. Every. Single. Time. I don't deviate. Why bother when you have found a good dish for a great price? The $2.99 3-egg Special includes three eggs cooked any way that you like 'em (I prefer over-medium), two pieces of toast, a decent-sized portion of crispy home fries, and a choice of two strips of bacon or two sausage links. For just under $3- I think this is quite a deal! Add in unlimited coffee, and "R" and I walk away with a bill (and our bellies quite full) for just $9.68. I double-checked this weekend. I just wanted to pay homage to my favorite local diner, and perhaps inspire you to check out yours next weekend. If you have any suggestions- pass them on. "R" and I love a good breakfast! Dining Deals Alert- Most of the menu can be found under the $10 price point. The BF and I normally go to Yours Truly -it's more of a fall/winter thing than in the summer. Can't wait to get back to that. I always hear good things about YT, but we haven't been there yet. I think there is a location not too far from us. Maybe that's our next breakfast stop!